As charter school advocates rallied en masse and California’s teachers unions flexed their political muscle, a cluster of bills that would dramatically curb the growth of charters in the state cleared the Assembly Education Committee on Wednesday. The votes were the first in what is figuring to be a lengthy, high-stakes battle between two of the state’s most powerful education interests. That the legislative panel passed Assembly Bills 1505, 1506 and 1507 on Wednesday wasn’t surprising — the authors of the trio of bills, sponsored by the California Teachers Association, made up two-thirds of the panel, which is chaired by Patrick O’Donnell, a longtime public school teacher and former member of the CTA’s policymaking assembly. While the two sides have battled for decades — typically to a draw — the political momentum has shifted this year in favor of organized labor. A recent wave of high-profile teacher strikes in Los Angeles and Oakland put the spotlight on unions’ claim that the growth of charter schools, which are mostly nonunion, has financially stressed traditional public schools, siphoning enrollment and public funding. And following the strikes, Gov. Gavin Newsom, who won office with the support of organized labor, signed fast-tracked legislation requiring charter schools to follow the same open-meeting and conflict of interest laws that school districts must adhere to. The new law and other charter restrictions had previously been vetoed by Gov. Jerry Brown. The three bills heard Wednesday aim to make the most significant changes to California’s charter school law in the nearly three decades since its inception. Depending on the viewpoint, the bills either make long-overdue and necessary reforms to how charters are overseen, or mark the beginning of the end for the state’s charter schools. 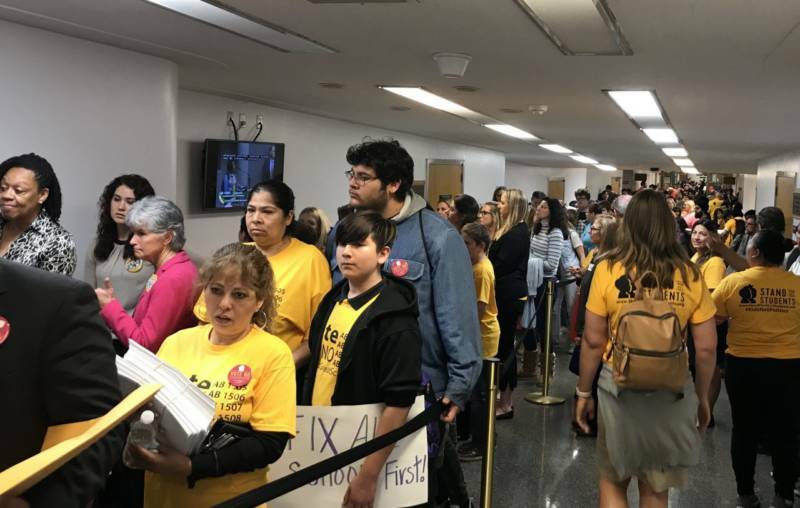 “Today, we could not be more clear: This package of bills is poison, and we will not go quietly,” Myrna Castrejón, the president and CEO of the California Charter Schools Association, told a crowd of supporters before the bill hearings. Combined, the bills would give local school districts the sole power to authorize charter schools, create state and local caps on the number of charters allowed to operate and put strict limits on charter school locations. A fourth bill sponsored by the state teachers’ union, SB 756, was not heard by the committee Wednesday, but calls for a five-year moratorium on charters unless the Legislature passes specific reforms by 2020. The latest legislative battle over charter schools comes as Newsom has directed state schools superintendent Tony Thurmond to lead a panel to study the financial impact charter schools have on school districts, with recommendations due by July 1. Assemblywoman Shirley Weber, a Democrat from San Diego, cited this ongoing study as her reason for not voting in support or against any of the three charter bills on Wednesday. “The report that the governor and the [state superintendent] are working on will be out within a couple of months and allow us to take a look at their findings and recommendations and potentially bridge them into the proposals that we have here,” he added. As Wednesday’s hearings unfurled, the scene at the Capitol was raucous. A line of hundreds of teachers, parents, students, administrators clad in red (in support of teachers unions) and yellow (supporting charters) snaked outside the packed Assembly hearing room where legislators debated the bills. Opponents outnumbered those in support. While unions and charter advocates have feuded for years, McDougall said Newsom could potentially shift the scales after years of legislative gridlock.